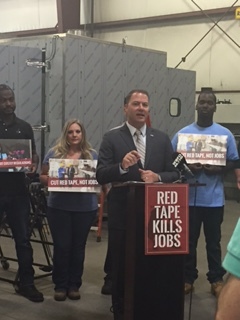 The Niagara USA Chamber joined Senator Ortt this morning to offer their support for the Red Tape Reduction Act. Deanna Alterio Brennen, President & CEO, stated that the Niagara USA Chamber encourages this movement to actively change the process and create a more competitive environment for small businesses so they can create new jobs. 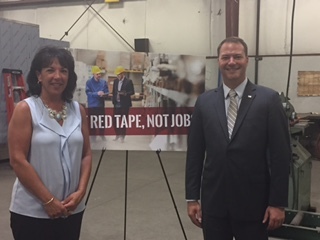 NORTH TONAWANDA – Senator Rob Ortt (R,C,I – North Tonawanda) joined local business advocates and employees of Audubon Machinery at the North Tonawanda factory today to push for his proposedRed Tape Reduction Act, which would cut red tape and allow businesses to thrive. As part of Ortt’s “Shake up the Status Quo” plan, the Red Tape Reduction Act will be one of his top legislative priorities moving forward. The legislation currently sits in the Rules Committee. The Red Tape Reduction Act would control the amount of governmental burdens placed on businesses that ultimately affect the cost of doing business. The legislation would help to improve New York State’s economic environment by eliminating or amending existing, duplicative state regulations when a new one is adopted. In the end, this would offset the projected cost of a newly adopted regulation on a business. The Red Tape Reduction Act is modeled after the Red Tape Reduction Act law enacted in Canada.